There are essentially 5 versions of writable DVD that you need to understand. They are: DVD-R, DVD-RAM, DVD-RW, DVD+RW and DVD+R. The distinctions are actually based on how the data is written to and read from the disk, and this differentiation is difficult to translate to the physical world, however one example might be language. First, let's divide the formats up. The first thing to note is that DVD-R and DVD+R disks can only be recorded once. You only get one chance to record your DVD movie to this kind of disk It's like pouring cement, once it is done you'll need to destroy it to change it. Further, DVD-R discs come in 2 types: DVD-R(A), for "authoring," and DVD-R(G), for "general." Both DVD-R and DVD+R discs will play in most DVD players, even older ones. So if you put your movie on this kind of disk there is a high probability that it will play in your living room. However, DVD-R(A) drives can not record to DVD-R(G) disks, and vice versa. There are also DVD formats that can be recorded more than once. DVD+RW, DVD-RW and DVD-RAM disks can all be recorded thousands of times. If you don't like how your DVD movie turns out, you can record a new version right on the same disk. These disks are more like painting a wall, if you don't like the color you just put on a new coat. Each of these rewritable formats are a little different. DVD-RAM, for instance, was created for storage of computer data like backing up your hard drive. If you want to get a DVD writer to back up computer data, DVD-RAM is a solid option. However, if you plan to make your own DVD movies, one of the other formats may be better suited for that activity. Most DVD players can't play DVD-RAM disks. The DVD-RW and DVD+RW formats are both good for making DVD movies but are essentially engaged in a Beta versus VHS-type battle. The consumer market will ultimately determine which format wins or they end up combining into a single standard, but it is important to understand that neither is yet a universal standard. Another thing to note is that many DVD players won't play any kind of rewritable disk. Most of the newer players will play these kinds of disks, but if you have an older DVD player it may not. In general, the newer your DVD player, the more likely it is to play all the recordable formats. DVD - RAM, DVD - RW and DVD - RW are the future technologies. The technical specifications have already been introduced. Both formats will have 4,7 GB capacity on a single side. A major difference between the two disc types is the format. The DVD-RAM is similar to magneto-optical discs (land and groove recording), while the DVD-Rewritable is basically a higher capacity version of the CD-RW. Both disc types rely on phase change technology for data storage. To record and read information, phase change technology takes advantage of the different reflectivity of a surface when either in a low reflectivity crystalline state. Like a CD, information is read from the phase change disk by distinguishing between dark amorphous and bright crystalline zones. This is a purely optical technology - only one laser is used for reading and recording. The layer structure of one half of the disk is shown in the following figure. A DVD for every application The current DVD standard allows several different physical versions of the disc. This comprises single and double sided versions - with single and dual layers possible on each side. 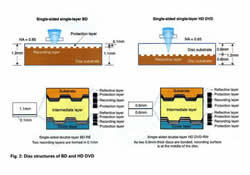 One single substrate of 0.6 mm can store 4.7 GB and the whole DVD up to 17 GB. The possible variations are DVD-5, DVD-9, DVD-10 and DVD-18. The first version to hit the market is the DVD-5, a single layer, single-sided DVD with a 4.7 GB capacity. The disc consists of a 0.6mm aluminized disc bonded to a blank substrate. The thin films for this type can be easily sputtered with conventional CD metallizers. Also available is the DVD-9, a dual layer, single-sided disc with a capacity of 8.5 GB. Production of this disc type involves a semi-reflective layer that reflects 18-30% of the laser light. This is enough to read all information from the first layer. It also transmits enough light; so the signal from the second, highly reflective layer can also be read. A highly uniform resin with a thickness of 40-70 �m, used to bond the two halves of the disc, separates the information layers. This distance is necessary for the laser to reflect a distinct signal of each layer. The structure of a DVD-9 is shown in the figure beside. Gold is well-suited as a material for semi-reflective layers, but coating costs can be cut by 70% by replacing Gold with other materials. Today, silicon and silver alloy are available as alternatives to gold. DVD-10 is a single layer, double-sided disc with a storage capacity of 9.4GB. In principle it is a double DVD-5 without the blank substrate. Two metallized discs are bonded together. For reading the information from the two disc halves, one laser is used, reading the information from different sides of the disc. The structure of a DVD-18 is in principle the same as a DVD-9, but a DVD-18 can be read from both sides by turning the disc in the DVD-player. The result is a double storage capacity in comparison to DVD-9. The principle structure is shown in the following figure. In the last 5 years, phase-change optical recording has advanced remarkably, and it has become a mature technology for rewritable data storage. Besides the general advantages (no wear, direct access, ...) that all optical recording techniques share - compared to (near-)contact recording - phase change provides back- ward compatibility with the widely accepted CD standard. Recently CD-ReWritable has been introduced in the market (650 Mbytes, >1000 overwrites). The active layer of phase-change optical discs is subject to crystallographic changes upon heating by laser radiation. Amorphous marks are written (see figure 1.a), utilizing a short high-power laser pulse that melts the recording material (T>Tmelt), followed by quenching to temperatures below the crystallization temperature (Tcryst). The latter procedure prevents nucleation and growth of the crystalline phase during cool down. In high-speed applications, like DVD-RW, fast crystallization is of course vital. Therefore, tcryst must be below 100ns, which severely limits the choice materials. Ternary stoichiometric compounds Ge, Sb and Te (e.g. Ge1Sb2Te4 Ge2Sb2Te5 ) not only meet demand, but also show a large optical contrast between amorphous an crystalline phases. Furthermore, they have acceptable melting temperatures (tcryst = 150-200�C, tmelt = 600�C). Proper phase-change recording demands a sophisticated write-strategy, that accounts for the physical properties of the disc (e.g. thermal conductivity and tcryst). The essential part of every pulse-width-recording method is the use of a multi-pulse write-strategy (see for example figure 3). Each recording mark is formed by a set of high-power laser pulses (e.g. Pwrite = 12 mW, tpulse = 15 ns). In between the pulses, the laser power is turned to a low level. Therefore, after each pulse, the molten material is cooled down to a temperature below Tcryst, resulting in an amorphous dot. Erasing (i.e. 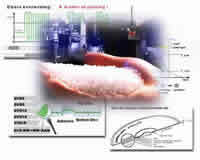 crystallization) is achieved by keeping the laser at a continuous power level (perase < Pwrite). Reading the recorded data is done at a much lower level (pread = 0.5-0.7 mW). Studios and consumers were asked to decide between two very similar technologies in the HD arena during 2007 and early 2008, HD-DVD and Blu-Ray. While both discs rendered an excellent image on HD monitors, HD-DVD discs were built with the same physical specifications as CDs, DVDs and game discs today, and had .6 mm of protection, which is the lens depth (safe scratch depth) on top of the digital wafer of the discs. This 6/10 of one millimeter of protection was identical to all CDs, DVDs, and Game Discs which have ever been made. 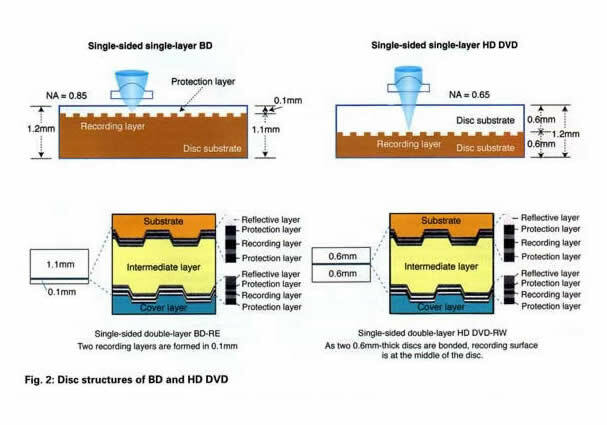 Blu-Ray discs, the survivor of the disc wars, are built with a .1 mm layer of protection, which is only one tenth of one millimeter, or one sixth of what is on current discs on the market. While Blu-Ray has applied a stronger coating to counteract the scratch protection issue, the coating is only 39/1000 of an inch in depth. While it is tougher than ordinary polycarbonate, this is not a tremendous depth to scratch through, and for this reason, we recommend that you store all Blu-Ray discs in a scratch resident holder/case. Summing up, Blu-Ray won the war, but it has left us with a storage problem. Bottom line for Blu-Ray, even a minor scratch can disable these discs. There are many storage cases available we recommend that you always store your Blu-Ray DVD is one of these cases.